4pm Goole Parish Church “Follow the Star” Christmas Celebration Service jointly with other Goole churches - band, video, refreshments afterwards with tea, coffee and mulled wine. 11pm St John's, Communion Service (note earlier start this year). On Sunday 26th October New Life Church on Mariners Street changed its name to Revive Church. The Goole congregation is just one part of Revive Church, a church meeting at four locations across Hull and the East Riding, and belongs to the Assemblies of God denomination. There will be a special service at the Cenotaph on Boothferry Road, on Monday 4th August at 11am. Goole Town Council invites all to attend the service, which will include readings, prayers, hymns and a minute's silence. The Vicar of Goole, Rev Rob Taylor, will lead the service, which will be the first of a number of events over the next four years. On 8th September, NBCC joined with New Life Church Hull, becoming its Goole site. More than just a name change, this makes the Goole church part of a much larger group working across the East Riding. Saint Joseph's to celebrate its centenary. Saint Joseph's Roman Catholic church will mark its hundredth anniversary with a celebratory mass on Friday June 28th, at 7pm. Reverend David Coote has been selected as the next minister of Central Church, Goole and some other churches in the area. He was inducted in a service at Portholme Church, Selby on Sunday 21st April. Methodst and URC congregations unite. The formation of a Local Ecumenical Partnership, formally joining Central Methodist and Christ Church URC, was celebrated on Sunday 22nd July 2012 with a service at what is now Central Church (Methodist & URC). The service was led by Rev Geoff Shutt of the Methodist circuit and Rev Kevin Watson, Moderator of the URC Yorkshire Synod, who preached. Ascension Day (9th May) to Pentecost (19th May). Friday 10th Trinity. Drop in to pray in the Green Room any time between 6pm and 9pm. Tuesday 14th 10am Prayer meeting at St Joseph's. Wednesday 15th Hospital Chapel. Drop in to pray any time between 10am and 11am. Thursday 16th 10am Communion service with prayers, St John's. Sunday 19th May, Pentecost 6pm Service in Trinity's hall. For details of the prayer themes for each day download this leaflet. The end of Methodist minister Colin Emerson's time in Goole was marked with a special service at Central Church on Sunday 27th May at 6pm, preceeded by a farewell tea. Trinity Church, Clifton Gardens. Come any time between 5pm and 9pm. Recordings of Lent Course 2012 - The Lord’s Prayer: How Jesus trains us for an adventure with God. Recordings of some sessions are available to listen to here. 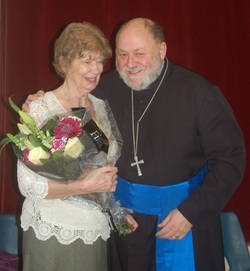 Rev Graham Maskery and his wife Vera. work and a presentation was made to him and his wife Vera. December 2011 We wish you a Merry and Blessed Christmas. Details of Christmas services throughout Goole are available here. Sunday 30th October 4pm in St John's, Church Street, our annual service for anyone who has lost a loved one. During the service, you will be able, if you wish, to light a candle in memory of those who have died, and prayers will be said in thankfulness for their lives and for those of us who are bereaved. Tea and coffee will be served afterwards in the Spire Community Centre, Church Street. Sunday 9th October 6.00pm, Central Church, North Street. A special service with guest preacher the Right Reverend Steven Croft, Bishop of Sheffield. Following the theme 'new treasures as well as old' the service will range from the traditional Authorised Version of the Bible, in its 400th year, and traditional hymns, to more recent prayers and songs. Trinity Methodist church was packed on Thursday 7th September as people from Goole and beyond gathered to remember community stalwart and Methodist local preacher Frank Ella MBE. Many people paid tribute to Frank's work. Chair of Goole Churches Together, Rev Graham Maskery, described Frank as a focus of unity among the churches and community, someone who always pointed to Jesus. Thursday 2nd 7.30pm Launch service in St Joseph's Church, preacher Rev Colin Emerson. Friday 3rd & Friday 10th 9.30am onwards. A team will be in and around the former Pride of Bride shop to pray for the town. Anyone can drop in with requests for prayer or to pray with us. Sunday 5th Noon - 2pm As part of The Big Lunch, Trinity Methodist church hosts a bring and share lunch, a chance to build community spirit. For more details call Liesl Warren on 07896538303. Monday 6th 2 - 4pm Call in at the chapel at Goole & District Hospital to pray quietly for the hospital, patients and staff. Tuesday 7th 10am– 1pm. Drop in any time to pray in the Spire Community Centre, Church Street. Feel free to stay for a coffee with the Goole Companions group in the main hall. Wednesday 8th 9.30 – 10.30am.Prayer meeting in New Beginnings Community Church /10.45am – 12.30pm Drop in any time to pray in Trinity Church Hall. Feel free to stay for a coffee in the main hall / 7pm Prayer walk. Meet outside St John's for a walk around the town stopping to pray at various places. Thursday 9th 8.30 – 9.30am.Prayers in St John's, followed by 10am communion service. Sunday 12th 6pm Closing service in Trinity Church with guest preacher Rev Philip Roderick.